Personalised drugs to treat individual people. Yeast-made cereal optimised for your gut flora. And a whole new range of goods made from nature's materials. These are the promises of bioengineering. "Good morning, Dave. Happy 100th birthday. Heart good, no abnormal cells, metabolism on track, DNA sequence correct, but Dave you need to get on the exercise machine this afternoon and don't drink too much at the party tonight." I bounce out of bed and get ready for work at the lab. Being a bit compulsive, I can't help but look at the actual data streaming from the sensors I wear on my pyjamas. They have fed the reassuring news to my "iWatch50" while I slept that, at 100 years old, I am in almost perfect health. Putting on my glasses, I can see projected on the lens that the heart traces, the blood metabolites and micro-nutrients and the amount of mutant DNA in my blood are all within normal parameters. My gut flora is the perfect mix of microbes to keep my digestion efficient and my immune system balanced and active. There is no doubt that that immune stem cell refresher treatment I took at 70 has done me a power of good. Thank goodness, I kept that bone marrow sample of mine that I stored as a 21st birthday present from my parents. The tiny nano reporters in my blood keep a 24/7 watch on me and beam the results to my watch as they pass my wrist. Now for breakfast. The room glows a lovely warm shade of green from the bio-lights that stored solar energy yesterday. My breakfast cereal was produced by yeast fermentation but tastes fabulous, flavoured as it is by spices also made by yeast but tasting of nutmeg and vanilla. I am hungry, so I add some bacon made by bacteria. I then get ready to ride to work on my bike, with a little assistance from its bio-battery. Before I head off, I brush my hand over the "Sanger" that does a quick sequence of my DNA and that of my microbial flora to do a final check that nothing nasty happened in the night. As a bonus it shows me who I shook hands with yesterday. Looking ahead is fraught with risks and the forecasts of those who have tripped up are legendary sources of amusement. Remember the one about how no one would want home computers? Or that 640 kilobytes of storage would be more than enough? And this one - "Transmission of documents via telephone wires is possible in principle, but the apparatus required is so expensive that it will never become a practical proposition" - by the brilliant Nobel Prize winner Dennis Gabor in 1962. 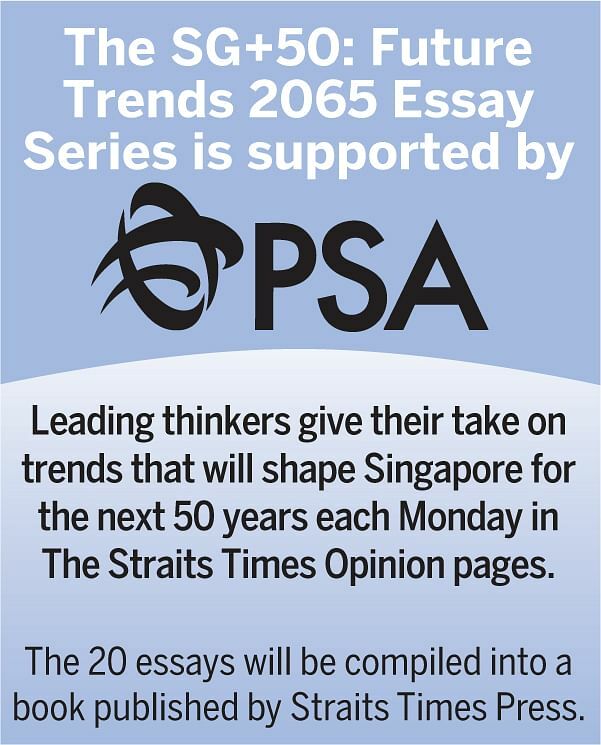 So why put my head on the block when asked by The Straits Times to try and imagine the impact of biotechnology and bioengineering in 50 years' time? Well, one good answer is that it will give someone a laugh in 50 years' time; but the other, which I much prefer, is that to think about the future is also to create it. So what can we be reasonably certain about, assuming that society allows progress? And what are the more uncertain but exciting, possible developments? First, it is good to remind ourselves of the true wonder of life on earth. Humans are just one of 10 million different species that share the earth, but all these species have a common architecture that the previous 70 years of research has been built on. That common architecture is DNA, the structure of which was first determined in 1953 when James Watson and Francis Crick defined the iconic double helix. DNA is remarkable stuff. It is able to code huge amounts of information in the linear sequence of four bases A, T, G and C in a tiny volume. Each of our one trillion or more cells contains two metres of the stuff, an immensely long thread of life. If we took all the DNA from a single person, the thread would extend to the sun and back 66 times! Now, we have cracked the brilliant readers and writers of DNA and the DNA proof-checking machines of nature, whose design has evolved over billions of years, to extraordinary levels of accuracy. By harnessing these machines (enzymes such as DNA polymerase and RNA polymerase), we are able to read and write DNA with great ease in the laboratory. The reading of DNA has dropped in price far faster than anyone could have imagined. Reading a whole human genome now costs US$1,000 (S$1,400) rather than the US$2.7 billion of the first one in 2001 or even the US$1 million of 2007. Already, a full sequence costs less than a chest X-ray and some are suggesting the one-cent genome by 2020. It is thus very likely that every human alive will be able to have their genome sequenced in 50 years' time. But would people want their genome sequenced, you ask? Well, it gives us a huge ability to predict and prevent disease as a consequence. DNA is also extraordinarily stable. This has allowed the use of DNA reading to identify the DNA sequence of Neanderthals from their ancient bones and show that some of their DNA is in fact still with us. It is the same trait that allows scientists to be sure that Richard III is Richard III even if buried in a carpark, and lets law enforcement officers identify criminals from tiny traces left at the scene of the crime. These strands of DNA also allow us great possibilities of design as we are now able to write in DNA bases nearly as cheaply as we can read it, again using nature's enzymes. Already, many of our most useful drugs are produced using living organisms that have been reprogrammed using designed DNA molecules to pump out just the drug molecules we need. By using one of nature's most versatile scaffolds, that of the antibody protein, we now have powerful new medicines for the treatment of cancer that work by re-awakening our own very specific defences rather than attacking the tumour directly. These new therapies have some patients freed of even advanced disease and with no poisonous side effects. Is it just drugs that this new technology allows? No, the so-called discipline of synthetic or industrial biology offers much more. We can begin to copy the extraordinary engineering of nature and, like modern-day Leonardo da Vinci, harness nature's amazing designs. Think of the range of materials nature makes, from the stunning glues that hold a limpet to a ship to the exquisite architecture of a bird's wing. Think of the wonderful colours of the butterfly or the light of the glow worm. Think of the electric eel with its powerful battery that uses no poisonous metals in its construction or the amazing ability of plants to convert sunlight to energy. Imagine every building powered by sunlight and every vehicle with a completely non-polluting biological battery. Remember that nature's machines can assemble themselves and repair themselves, giving them tremendous resilience. Now, we are in a position to harness all of these processes and industrialise them. All our food will be produced safely and all waste reused. Already, over one-third of the world economy is based on biology in the main areas of medicine and agriculture, but in 50 years' time, biology will also be the source of most manufactured goods. It is going to be an extraordinary 50 years ahead. Singapore is playing its role in all these amazing advances. Our hospitals are increasingly using DNA sequencing to choose the right treatment for cancer and other patients. The new materials of nature are being explored in A*Star's Molecular Engineering Lab. For example, scientists have identified the DNA code for the proteins that make the squid's beak so strong. Work in the immunology labs of A*Star and the National University of Singapore has led to a potentially very powerful new antibody treatment for dengue. Singapore's integrated approach is an ideal development ground for the technologies of digital health that will keep Dave so healthy and happy on his 100th birthday, and with Apple, Google and Samsung all busy in this space, progress will be dramatic. The new industry of wellness will be driven by innovations that will help us all to stay incredibly well and fit. I believe the Red Dot can be a beacon for this new industry. • Professor Sir David Lane is one of the scientists credited with the landmark discovery of cancer gene p53 , called the "Guardian of the genome", in 1979. He is currently the chief scientist of the Agency for Science, Technology and Research (A*Star), where his main role is to advise and engage in scientific development across the Biomedical Research Council and the Scientific Engineering Research Council at the strategic level. He is Scientific Director of the Ludwig Institute, a not-for-profit foundation, that promotes and funds international research on cancer. He is also the chairman of Chugai Pharmbody Research, which he helped to attract to Singapore.